Happy birthday, Bosque! Of course, we’re the ones who get the presents. We already highlighted a bunch of weekend events in The Week Ahead in Beer, but brace yourselves, there are even more. Is there too much of a good thing? Or will it just force us all to plan things out as carefully as possible? Either way, this might be a good weekend to cash in any owed designated driver days by a friend or family member. Or join Uber. Or dust off your bicycle (assuming the weather holds). It is hard to believe Bosque is already 3 years old, but that is what they are celebrating this weekend. 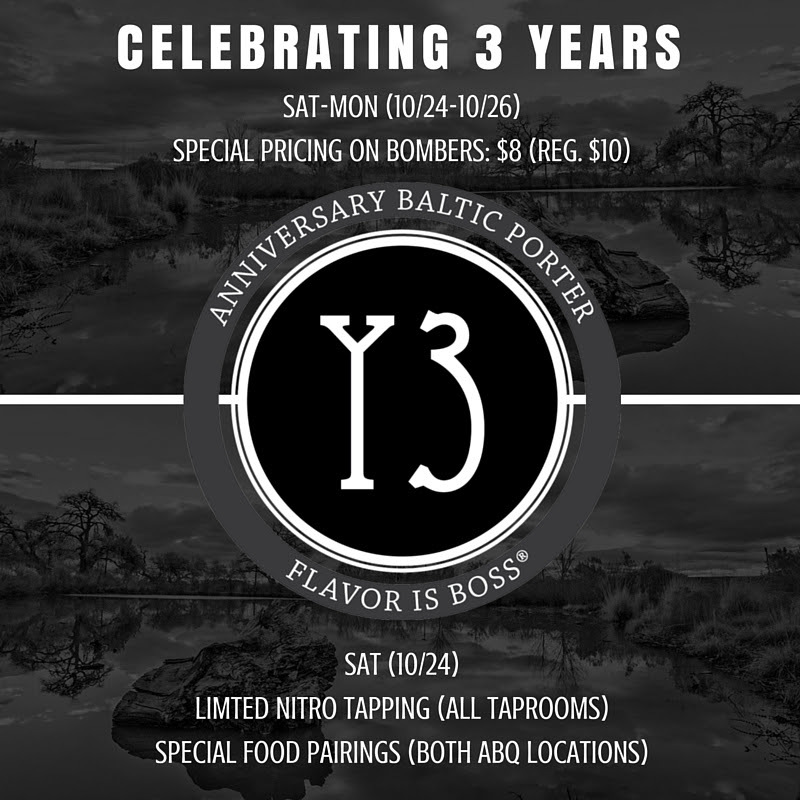 Saturday will feature two special kegs of the Anniversary Baltic Porter on nitro at the San Mateo and Nob Hill locations. There will also be some sweet food specials. We were already going to stop by and buy a bomber for $8 (regularly $10), plus snag a pint, but the food specials will ensure our participation. Kudos, Bosque. This takes geeking out to beer to the next level. 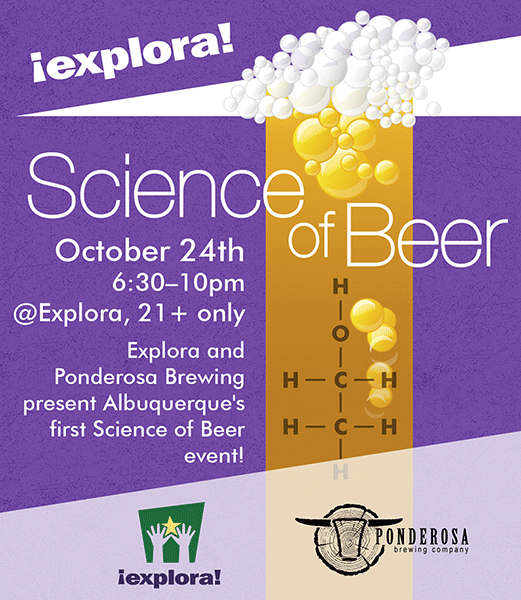 The Explora Science Center and nearby Ponderosa Brewing are teaming up this Saturday night to host an even dedicated to the science of beer. From 6:30 to 10 p.m., this 21+ event will feature lectures and activities hosted by Ponderosa, The Dukes of Ale, and Southwest Grape and Grain staff members at Explora. Learn the history and science of beer and how it’s made. The cost is $10 per person, or $8 for Explora members, and you can purchase your tickets online here. There will be some food provided by Ponderosa, plus live music by Eileen & the In-Betweens. High Desert Flameworks will also be on hand to demonstrate how they create the proper glassware that affects different styles of beers. The afternoon football slate this Sunday deserves to be skipped. 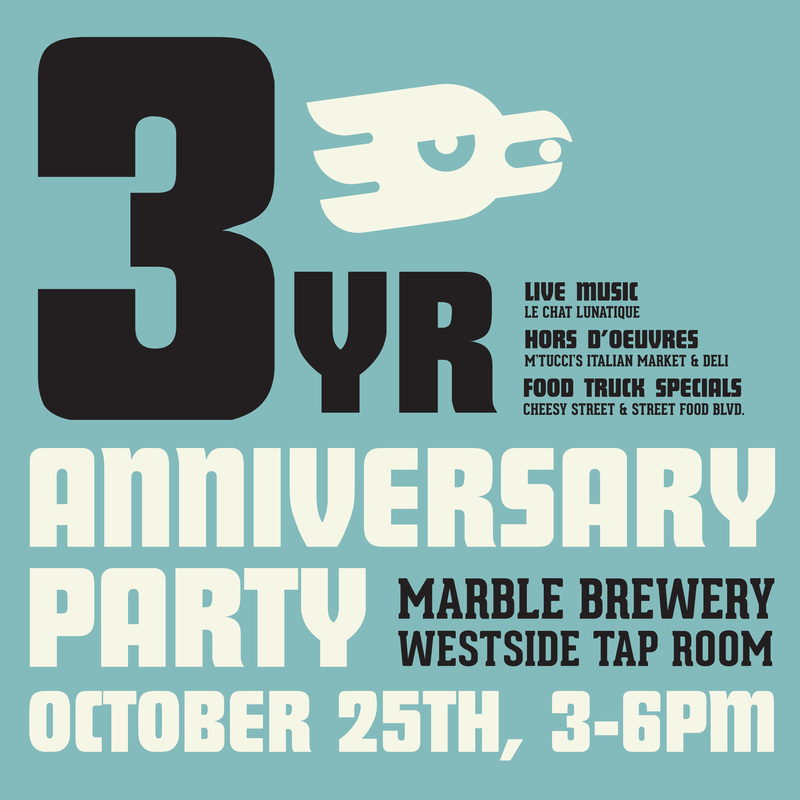 Marble’s Westside Taproom also turns 3 this weekend and will host a party Sunday afternoon from 3 to 6 p.m. There will be special food treats from Cheesy Street, Street Food Boulevard, and M’Tucci’s Italian Market and Deli. Le Chat Lunatique will provide the music. Oh, and after snagging a pint downtown Thursday, I have to recommend the Nitro Seduction if it is still available. Creamy, multi-flavored goodness, it has stout, porter, and brown ale elements, with just a hint of possible barrel aging. Now this one just sounds crazy. If we did not get it directly from Denise Baker, who owns Rio Bravo with her husband Randy, we might not believe it. This Sunday from 1 to 5 p.m., Rio Bravo will attempt to host the largest shaving cream fight in world history. For just $5 you gain entry and a can of shaving cream (if you want to bring your own, that is acceptable as well). There will be a live DJ and several bands performing, including Leah Leyva and the Band. There will also be a shaving cream bikini contest, shaving cream wrestling, shaving cream beard contest, and best team costume. All of this will benefit St. Jude’s Children’s Research Hospital. Cosmos Porter is out of this world. Oh, come on, you knew we had to make a joke that bad at least once. It goes with the lack of focus in this picture. If you are down for something a little quieter, and happen to be a porter fan, this is a good weekend for you. In addition to the aforementioned Anniversary Baltic Porter at Bosque, you can indulge in the new Cosmos Porter at Red Door and/or the La Llorona Baltic Porter at La Cumbre. I tried the Cosmos (5.2% ABV, 32 IBU) on Thursday and found it to be rather delightful. There is a pronounced hop bite you do not usually find in porters from the Apollo, Comet, and Galaxy hops. They blend nicely with the chocolate and roasted flavors. The La Llorona (8.6% ABV, 40 IBU) is back for another run. It was one of the last beers brewed on the old brewhouse, using German and British ingredients. It is big and beefy and perfect for the cooling weather. Don’t forget about all the other events we mentioned in The Week Ahead in Beer, including the pumpkin carving contest at Boese Brothers, the Dogtoberfest at Distillery 365 (both Saturday), and the Desert Darlings’ Halloween Bo Ball at Kaktus on Sunday. Wherever you end up this weekend, make sure to enjoy yourselves responsibly out there. The Crew will be out and about, so keep an eye out for us. The Week Ahead in Beer: Hoppy Halloween everyone!